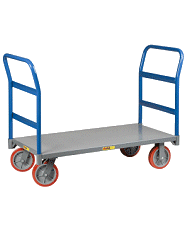 Lift and lower heavy items for easy loading and unloading. Great for lifting machinery and awkward items. Two speed controls to save time in liftng. Easy foot pedal release to lower items. 660 lbs. 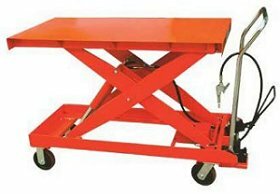 42" x 37" x 41"
The Air Hydraulic Lift Table is great for transporting machinery and equipment. Place your order today and get FREE shipping! The Air Hydraulic Lift Table is the newset, best and easiest way to lift and lower heavy items with the least amount of effort. Operated with an air compressor (not included), the lift table makes it easy to lift and lower items with little effort. Use the lift table to move machines, garage equipment, tool boxes and other items into variuous positions with ease.